White rhinos, the last remaining species of rhinoceros that is not endangered, will receive new US protection due to an intensifying poaching crisis, federal wildlife officials said Tuesday. 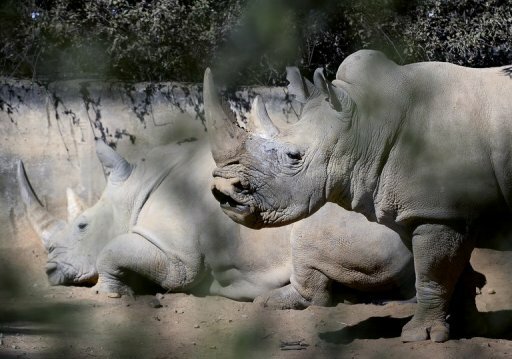 WASHINGTON (AFP) – (AFP) – The last remaining species of rhinoceros that is not endangered will receive new US protection due to an intensifying poaching crisis, federal wildlife officials said Tuesday. The southern white rhinoceros, found mainly in South Africa, will now be considered “threatened,” which bars their sale and trade in the United States under the Endangered Species Act. “This new action prohibits the sale or offer for sale in interstate commerce of this species and its parts and products, consistent with all other rhinos,” said the US Fish and Wildlife Service. South Africa is home to the world’s biggest rhino population but killings have surged in recent years, with 668 rhinos poached in 2012. Already there were 446 rhinos killed in the first six months of 2013. In contrast, there were just 13 reported rhino killings in South Africa in 2007. “As both a transit point and consumer destination for illegal rhino horn products, the United States plays a vital role in curbing poaching and wildlife trafficking,” said Fish and Wildlife Service Director Dan Ashe. The change is possible due to a “similarity of appearance” provision of the act that “will aid international law enforcement efforts to fight poaching and crack down on trafficking in rhino horn,” the Fish and Wildlife Service said in a statement. Illegal trafficking of rhino horn has surged worldwide, due to high demand in Asia for the horns which are prized for their supposed ability to cure cancer and other ailments. However, while the ground-up horn powder can trade for the same price as cocaine or gold, they contain only keratin, the same substance found in fingernails. “Scientific testing has repeatedly demonstrated that it has no medicinal value,” said the FWS. Four of the five rhino species that survive today in the wild are fully protected as endangered species. They include the black, Sumatran, Indian and Javan rhinoceroses. The white rhino, which includes the subspecies of southern and northern white rhinos, has been unprotected until now. There are more than 20,000 white rhinos alive in Africa, according to the International Union for the Conservation of Nature. Since genetic testing to differentiate between species is difficult, traffickers have often labeled rhino horn products as southern white in order avoid trade restrictions. The Convention on International Trade in Endangered Species of Wild Fauna and Flora (CITES) subjects white rhino horns to import and export restrictions. Despite the US change in designation to “threatened,” current permit requirements for sport-hunted trophies of southern white rhinos will not change, the FWS said.